(Canadiana - Cabinet Card) LOUIS RIEL “RESSEMBLANCE PARFAIT” CABINET CARD. Approx. 3 ½”x 4 ¾” albumin photo of a painting of Riel pasted on a 4 ¼ x 6 ½ card. There is a statement authenticating the image as a true likeness which roughly translates to: “We, the undersigned, declare and certify that this photograph is the true copy of the portrait of Louis ‘David’ Riel, whose original is the property of Abraham Guay. Signed Widow Julie Riel; Joseph Riel; Alexander Riel; Widow Marguerite Riel; Octavie Lavallee; Henriette Poitras. Date at St. Vital, January 12, 1886. 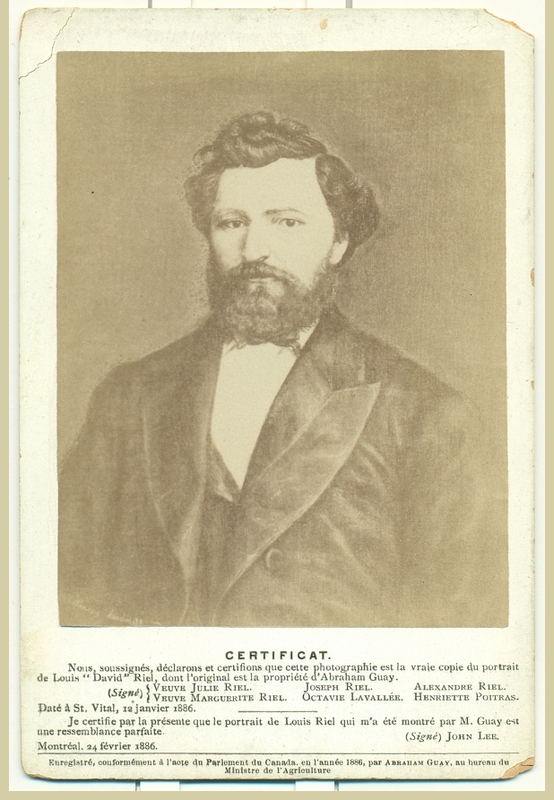 I hereby certify that the portrait of Louis Riel, which was shown to me by M. Guay, is a perfect resemblance. Signed John Lee. Montreal, February 24, 1886. Recorded in accordance with the Act of the Parliament of Canada in the year 1886 by Abraham Guay, in the office of the Minister of Agriculture.” The card was created just months after Riel’s death, supposedly to dispel confusion about what Riel had looked like (though we cannot ascertain why that was of concern to the family). The painting depicted is in fact done from a photograph held in Library Archives Canada (C-0180820), but the creator of the photo, as well as the painter are unknown (perhaps Guay had it commissioned). Right corners chipped, still a clean, bright example of a curious Riel artifact.